I love makeup brushes! For me, half the fun of makeup is the tools for application. 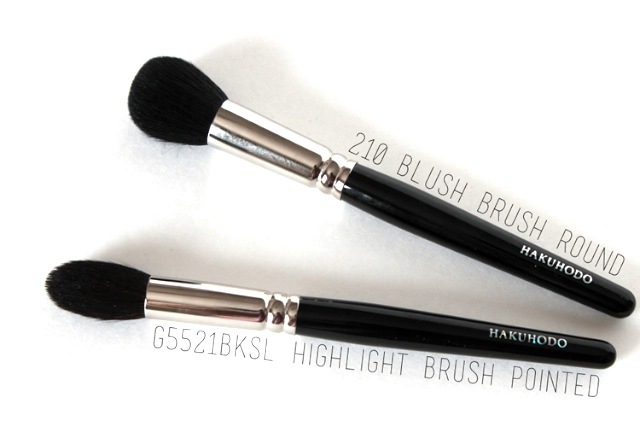 Back in January, I placed an order for a couple Hakuhodo brushes and I thought I’d share them with you. I've never owned any of these brushes before, so I only picked up a couple to try. Hakuhodo doesn’t have free standing stores (that I know of), but they do make appearances at various makeup trade shows (like IMATS). 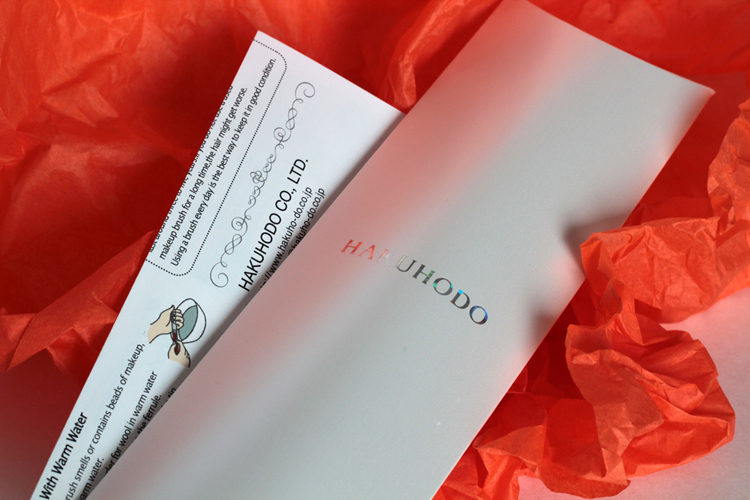 If you’re unfamiliar with the Japanese brand, Hakuhodo is one of the leading manufacturers of brushes (not only cosmetic brushes, but artist brushes, too). They have a great video about their history and brush-making process, I’ll link it here if you’d like to see it. I think all you brush aficionados will appreciate it. 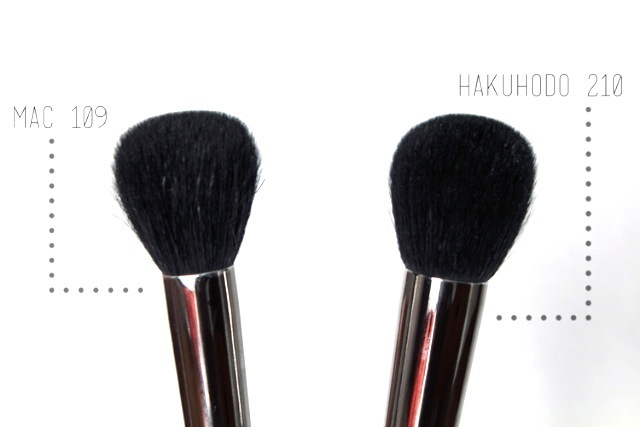 Hakuhodo has several brush series and they come in all shapes, sizes, hair types, and price points. Their signature brush line is distinguishable by the orange handles and gold ferrules. The other brush series have plain black handles and silver ferrules. I love tapered / pointed brushes like this. I find them quite versatile. 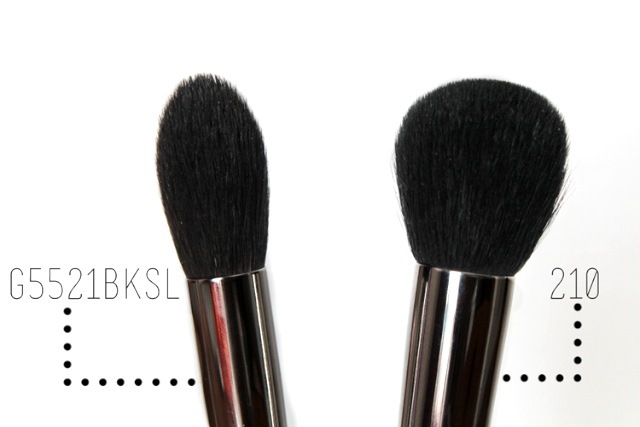 You can use it to highlight, to contour, and to powder. I also use this brush to set my under eye concealer with Bare Minerals Well Rested. The bristles are a mix of blue squirrel / goat and really soft. I’ve washed the brush several times and I haven’t experience any shedding yet. This brush called to me because it reminded me a lot of my beloved MAC 109. It has the same shape, but it’s much denser than the MAC 109. I love the shape of this brush, it’s great for packing on or for buffing product. I use it for blush, bronzer, and highlighter. The bristles on this brush are goat and also quite soft. On the fifth wash, it did shed a couple hairs, but nothing since. I reach for this Hakuhodo 210 all the time, it has definitely replaced my MAC 109. I purchased both these brushes online from Hakuhodo USA. They do ship internationally. I paid $12 for shipping to Canada and it arrived in my mailbox within a week & a half. I didn’t get charged any customs, but it’s something to always be ready for (sometimes you get charged and sometimes you don’t). I love my Hakuhodo 210 but I actually don't find it that soft. The bristles are kind of stiff. I find their J-Series much more softer :) I love my J110! I was looking at your older posts because I first heard of the Missha brand from your blog. There's a store called M Brand shop near Yonge/Finch that carries it and a bunch of other Asian makeup brands. I went in there today for the first time to pick up a tube of BB Cream - same one you got in #27. Just thought you might like to know for when you repurchase it or are interested in other asian brand stuff because Markham seems so far for you to travel from downtown! Thank you for letting me know! I will definitely have to pop over there soon! I'm obsessed with Asian cosmetics at the moment! I could make #23 work with me -- took some playing but it's manageable with bronzer / blush. I think I got that shade because it was the darkest one they had at the time. But #27 is MUCH better! It's a lot more forgiving & it's definitely the shade I would repurchase! I hate my Mac 109 brush! It sheds like crazy and I don't find it soft at all. I've been wanting Suqqu brushes ever since Lisa Eldridge has been talking about it, but I can't justify paying that much for a brush. I might have to check out Hakuhodo brushes instead. Do you when the next IMATS will be in Toronto? Will you be attending? I hear you! I've been itching to get my hands on Suqqu brushes ever since I saw Lisa Eldrige rave about them haha :).